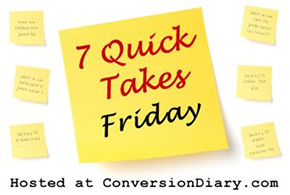 My Very First 7 Quick Takes #7QT | Pray. Work. Motherhood. I live down in League City, but my Goddaugther was Baptized at St. John Vianney’s. So many great things are going on at that parish! I am glad that you enjoyed the conference with Dr. Hahn. Thanks, Ann-Marie! It was a great weekend. We love our parish! Welcome to my little blog. Go you on your first 7QT post. Today was mine, too! I’ve always wanted to link-up, but never got around to it. I’ve gotta get into this feast day stuff with our family. Ugh, Catholic mom fail? What do you do? Do you have a Pinterest board for that stuff? Heather, thanks for stopping by! Congrats on your post, I love it 🙂 You’re not failing! Someone once said, “Beginning is half done.” So just jump in somewhere and start. God will bless your efforts, no matter how small! I love the Catholic Cuisine blog (linked in my intro post) because it is chock full of great ideas and recipes for bringing feast days alive. If we are having a hectic week, I try to pick just one activity or food – to keep it real. If I find myself with more time, like I did this week, I go a little more in-depth. The important thing is that you do something, even if it’s just sprinkles in their yogurt.